Flexible Single Point Hose Kit, recommended when heat is generated over a smaller surface area. 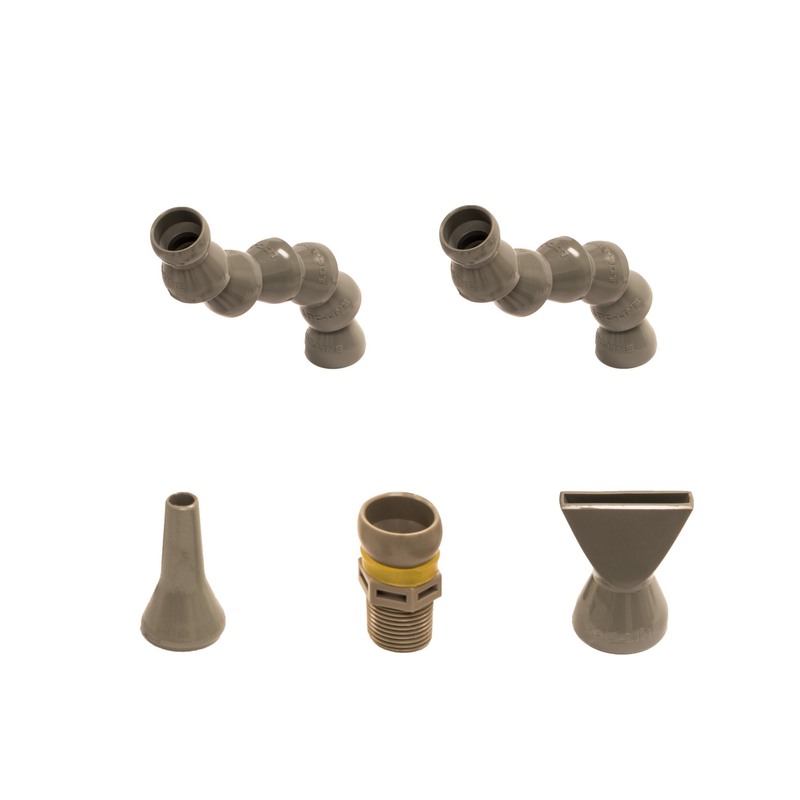 Single Point Hose Kits include cone and flat fan nozzles for aiming the cold air flow and are approximately 11" long. Which Cabinet Cooler should I use?What is the temperature range for the ETC?Will EXAIR Corporation Cabinet Coolers cause condensation inside our control panels?Can the ETC be used with other products besides your Cabinet Coolers?Can I mount EXAIR’s Cabinet Coolers to the side of our enclosure?How do I get the solenoid valve on the Cabinet Cooler to stop chattering?What is the Btu/Hr range of your Cabinet Coolers?What is the material of EXAIR Cabinet Coolers?How can I determine which EXAIR Cabinet Cooler® System I have?Will a Cabinet Cooler® System operate at less than 100 PSIG?Why do I need a Cold Air Distribution Kit?Why should I avoid using a non-contact temp gun (infrared heat gun) to determine my cabinet temps?Can the thermostat be adjusted to maintain an internal temperature different than the preset 95° F?What muffler do I need with my NEMA 12 Cabinet Cooler® System (mufflers are included w/ NEMA 4/4X)?What are the benefits of an ETC over the thermostat controlled Cabinet Cooler® System?What temperatures can the ETC be set to?Can I use a Vortex Tube to cool my electrical enclosure instead of a Cabinet Cooler?What is the maximum operating temperature for the Cabinet Cooler System?